Editor’s note: This post first appeared in the quarterly magazine the DNA Decoder, a publication written by students, for students. The magazine is designed to help students across the nation connect with each other and share interesting ideas around genetics. On a given week, Dr. Heather Mefford, M.D., Ph.D. can be found juggling a busy schedule that is split between seeing patients, who include children who suffer from epilepsy caused by abnormalities in their genetic codes, and conducting research to find a cure for genetic disorders. As a physician and principal investigator at the University of Washington-Seattle, Dr. Mefford hopes that her research will help to create better diagnostic tools and treatments for patients who have health conditions with an underlying genetic cause. In this interview, Dr. Mefford shares some of her thoughts and experiences about her work as a physician and researcher. Growing up, I always enjoyed math and science. In high school, I was lucky to have really great science teachers. I was good at it and I really enjoyed it, so I tried to figure out how I could make it into a career. What is it about genetics that particularly interests you? My interest in genetics came a bit later. In college, I actually majored in chemical engineering. For me, that was a great way to apply high levels of math and science together. But I realized along the way that I didn’t want to pursue the particular type of work that chemical engineers generally do. I began to explore more biology courses. I took a genetics course, and from that point I started to really enjoy the human aspects of biology. Looking back, I probably would have pursued a biomedical engineering degree if that was available at the time. I then decided to pursue a MD/PhD program, since I knew that I really liked both medicine and science research. I originally thought that I would study bioengineering for my PhD, but I ended up working in a genetics lab for a year, which—along with meeting great people along the way—really led me to fall in love with genetics. How do you balance your clinical work with your scientific research? My clinical work accounts for about 20% of my time and my research accounts for the other 80%. I’m in the clinic seeing patients with genetic conditions about one day every other week, on average. The rest of the time I am in my lab. Your lab’s areas of interest are epilepsy, pediatric disorders, and novel genetic disorder discovery. How did you become interested in these areas of genetic exploration? I started with pediatric training after medical and graduate school. I was really interested in what exactly goes wrong in a genetic condition or syndrome, such as the specific gene or pathway that has gone awry. I really enjoyed learning about gene discovery and how it can teach us both about these conditions and also about normal development. After my residency, I returned to working in a lab and studied chromosome disorders and how chromosome structure can determine chromosomal disorders. My initial research was based on finding small deletions and duplications in chromosomes that cause birth defects and other disorders. My interest in epilepsy grew as it was one of the disorders we were investigating in our research. I was lucky enough to collaborate with a fantastic group who had been collecting patients with epilepsy for years and was interested in finding a genetic connection. They had the patients and the families, and I had the genetic tools and expertise. We’ve been working together ever since. For someone who doesn’t have an extensive background in science, which may be the case for some of our readers, how would you explain your research and the findings of your work? We try to identify genetic changes—changes in DNA—that cause kids to have seizures, and often along with that, have poor development. We try to understand what goes wrong in their DNA to cause them to have such seizures, along with other disorders. Additionally, that helps us understand, on the clinical side, how likely it is to happen again in that same family. Sometimes, identifying the specific gene that causes epilepsy can help us identify the right medication to prescribe a patient, or which medication to avoid (this is less often the case, but can be extremely helpful). By doing this, we gain a better understanding of the biology behind epilepsy with the goal of one day developing even better treatments for patients with these disorders. But for now, in the short term, we are able to have better diagnostics for our patients. Scientific research is defined by continuous trial and error. What lessons have you learned from experiments or research approaches that have not gone the way you expected? You definitely learn perseverance. This persistence will encourage you to keep trying at something until it goes right. Sometimes an outcome can really surprise you, and you learn something new in addition to an outcome you may have been expecting—which could lead your work in a different, maybe even more exciting direction. You also learn when to take a step back from your work and look at the bigger picture when things may not be going as planned. What impact do you hope your research may have in the context of medicine and our understanding of the genetic contributions to disease? I’m really excited about the contributions we have made and are currently making in the field of genetics. I hope to contribute to identifying the majority of genetic causes of pediatric epilepsy. I hope that this work will help families understand what is going on with their children, which I hope can help them make the best possible decisions for their child’s care and for family planning, and so forth. We really hope to help in either preventing the disorder or identifying the best ways to treat it. Overall, I am optimistic that our contributions can pave the way for future research, whether it is for our group or other groups. Does having a clinical background impact your scientific research, and vice versa? I think it’s beneficial to have the connection of being able to see the kids and understand what life is like for their families; I think it is a reminder of why we do the research that we do, and it definitely keeps us going. Having the connection for me is incredibly nice, and it gives me a great variation in what I do on a day-to-day basis. As a successful woman in the STEM field, do you have any advice for young women who wish to pursue a career in STEM? My first piece of advice is if you love to do something, go for it! Don’t be daunted by anything. My second piece of advice is to seek out successful women in the field of work you would like to pursue so that you surround yourself with mentors that are doing the things that you want to do, who can give you guidance and advice and show you that it is possible. Do you have any undergraduate researchers in your lab? If so, how are they involved in the research your lab conducts? I have lots! We love to have undergraduates. They contribute to various projects in the lab depending on their skills and experience. We start undergraduates as volunteers so that they can get acquainted with the lab environment and decide if they like it here. If they find their place, we try to find a small project for them. Sometimes their projects are contributing to a larger project that requires lots of hands. Other times, their projects are things that we would like to do but haven’t had the time to pursue yet; this allows them to have a more independent project. We give our undergraduates course credit for the research that they do, and we also include them on publications for the projects that they do. More information about Dr. Mefford’s lab and research can be found here. Ava Daniel is a sophomore at Yale University majoring in Molecular, Cellular and Developmental Biology. She is a Yale Freshman Research Fellowship recipient and a research assistant at the Yale School of Medicine. Aside from academics, Ava is a Community Health Educator, for which she teaches health education in New Haven public schools, as well as an active mentee of neurosurgery at Yale-New Haven Hospital. 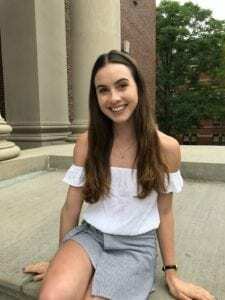 She is excited to be a Genetics Education Student Leader and create educational content to inspire students across the country in genetics and other areas of STEM. She is originally from Millbrae, California and hopes to attend medical school after Yale.